There are a few 2017 guys who haven't signed yet who might still be on the market in 2018. Wow, I feel really horsefeathering old after reading that tweet and I'm not even that old. Some of these former players must have had kids really young like Addison Russell lol. New Cuban defector is waiting to be granted free agency. He's subject to the new CBA rules since he's only 21, so hopefully he'll be granted free agency by July when the Cubs are out of the penalty box. SANTO DOMINGO, Dominican Republic—Julio Pablo Martinez, a 21-year-old center fielder who has been one of the top young players in Cuba, has left the country to pursue a contract with a major league team. 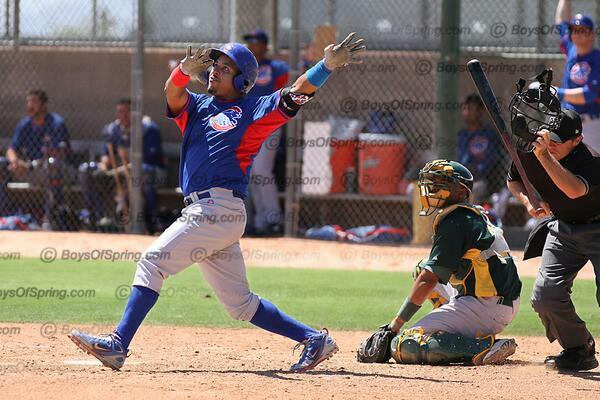 At around 5-foot-10, 180 pounds, Martinez is a lefty with a promising combination of power and speed. Last season in Serie Nacional, Cuba's top league, Martinez hit .333/.469/.498 in 264 plate appearances with 52 walks, 30 strikeouts, six home runs and 24 stolen bases in 29 attempts. Based on his present ability, he's probably ready to go to a high Class A or Double-A team. Eligible when the Cubs are out of the penalty box, but we're getting to the point where many big spending teams have already allocated their funds with pre-arranged deals. That's the type of arm you'd love to get in the system. The curve looked fantastic too. True. I'm glad we aren't connected to the top 10 guys or whatever it was Badler had written on earlier. At any rate, I have no clue how much we've already committed. Its possible we spread it around and have little money left. But, its also possible we waited things out to see what bargains fell late. Either way though, I LOVE that we can trade for more money in the new CBA EVERY year, since there's no going over your amount anymore. I really, really want to see us doing that going forward. I gotta wonder if the Twins did this to give them a slight shot at Ohtani. Penalty will be announced before Thanksgiving, months before he Cubs are out of the penalty box. We don't even know if they'll be under IFA restrictions or not. Assuming he/they are, there's very few teams with money to spend. They could easily wait until July. It would be awesome if we could swipe one of these guys somehow. Are we out of the penalty box this coming July to go wild again? Cubswin11 wrote: It would be awesome if we could swipe one of these guys somehow. Are we out of the penalty box this coming July to go wild again? Out of the box in July 2, 2018, yes. Cubs can't go as wild now, with the stricter new CBA. Although, the trick may be finding teams willing to trade their pool money. Still, I hope we ask for it in any and every deal we make......There's no more 1st, 2nd, 3rd, or 4th slots now, you can just trade a specified amount now. So, Rosenthal says they ARE going to lose prospects, as PART of the punishment. So maybe he'd wait? Or the Yanks or Rangers could grab him. davell wrote: So, Rosenthal says they ARE going to lose prospects, as PART of the punishment. Or the Twins now, I guess. It would be great if Maitan had an ego about the signing bonus, and was willing to wait until he could get the $4 million again from some team. Given that I don't believe the Cubs were mentioned with any of the bigger name IFAs yet for next year, they could be in a position to pounce. I would be floored if the Cubs left any of their IFA pool unspent. At this point it's obvious that they aren't going to be shelling out $3 million to one of the LA bonus babies in the 2018 class, so I wonder if they are taking the shotgun approach or if they knew that they would need the majority of their pool for a Japanese or Cuban player? I think they've held out for one of the Cubans personally. I'm very hopeful they try to add IFA money and get a hell of a class, considering the system is weak currently. Wouldn't shock me to see them add one of the Braves guys either, depending on if they make it to July 2nd. I wouldn’t completely eliminate them trading pool money either. They’re at a point where maybe spending on IFAs that aren’t ML ready is less valuable to them than say a team like say, randomly picked out of a hat, the Rays or Jays. I have no idea what the 2018-2019 IFA period has lined up. That said Cuba’s lost many big names and after Otani the next most exciting player from Japan is a 2B who will not fall under IFA restrictions if he left the NPB. Most of Badler's articles have focused on the DR so it's possible the Cubs have already honed in on some big names in Venezuela or emerging baseball countries like Panama or Colombia. I agree the Cubs will maximize this international class. This regime spent big on Soler before the caps were instituted, spent all their money in 2012 and blew past their spending thresholds in 2013 and 2015. They aren't going to ignore the international market now, especially now that they aren't drafting in the top 10. TomtheBombadil wrote: I wouldn’t completely eliminate them trading pool money either. They’re at a point where maybe spending on IFAs that aren’t ML ready is less valuable to them than say a team like say, randomly picked out of a hat, the Rays or Jays. Has Shintaro Fujinami gone the way of Yuki Saito, the guy that was supposed to be a rival to Tanaka for years?